Sky News, the preferred leaking destination of CVC Capital Partners, has declared that News Corporation and Exor, an Italian holding company, are bidding to buy the Formula One group from CVC. Exor is an industrial holding company controlled by the Agnelli Family, who are also known as the owners of Ferrari. The firm can be traced back to the 1920s but became Exor in 2008 when two Agnelli companies IFI and IFIL were merged. Giovanni Agnelli & C. owns 59 percent of the company’s stock, while other investors includethe Mackenzie Cundill Group and Bestinver. The remainder of the shares are traded on the Italian stock market. The company owns a 30 percent stake in Fiat, plus 60 percent of Juventus and various other companies. Exor is headed by John Elkann, chairman and chief executive of Fiat. The word is that there will be other members of the consortium as momentum builds. The aim is to buy out CVC Capital Partners and, one assumes, set up a new structure to take the sport into the future. It remains to be seen what will happen with Bernie Ecclestone, who remains a shareholder in the business. 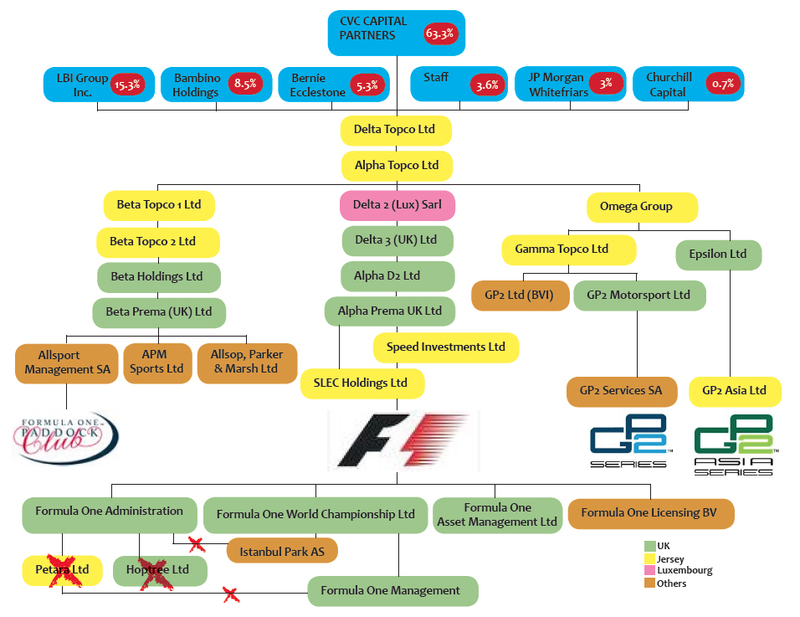 For all of those who struggle to understand who owns what in F1, I am also posting a chart of the companies involved. So that means Ferrari’s involved, indirectly? Sky and Ferrari; I can’t think of a more unpleasant combination. It might be a sign for me to hang up my F1 hat and take up a different hobby. I hope this does not go through!!! I do not feel like having to pay to watch F1 races. News Corp need to stay out of F1! I tried to figure out the list. Now I have a headache. Why so many tiers of companies above the base products? Is it just to prevent transparency of finances or is there another, less devisive, reason? That could just signal the end of me watching F1 on the TV. If they end up narrow-casting it I shall not be watching; I refuse to pay the Murdoch empire any of my hard earned cash. Annoyingly the Beeb’s cash, and therefore mine, would have to go there anyway even if F1 stays on free to air TV. Joe: is there any reason why it’s quite so complicated? Beta Topco 1, Beta Topco 2, etc, etc. Is there a conflict of interest FIAT/Ferrari owning the commercial rights to F1? The EU didn’t even allow the FIA to control the commercial rights, surely letting a competitor and/or their parent company is a non-starter? Isn’t the fact that they are partial owners of ferrari a conflict of interest? … and this is coming from a Ferrari fan. I think If they want to buy F1 they should be made to sell their stake in Fiat/Ferrari in the interest of transparency. I thought Bernie said that if there was such an idea, he would know since he knows the Murdochs, there for, it was all rubbish. Well he didn’t, and the team he always favours and seeks to protect is partly behind it. Was he lying? Or does he now look incredibly stupid? Also, is there not a severe conflict of interest if the owners of a team also own F1? I’m kinda on the fence on this one, partially because i don’t understand it anywhere near enough! I’m certainly not keen on Ferrari and NewsCorp owning the rights to F1. NewsCorp are just not a favourite (because of their political stance more than anything), and as for Ferrari……..I admit, I’m not a fan, but 1 team having that much involvement can’t be good! If it’s was all the team, in the guise of FOTA or the likes, that would be a great thing! And that’s where my indecision lies, there could be great potential in this in terms of changing the way F1 operates. I thought that already, but now I’ve seen Joe’s diagram, that REALLY needs to happen! In terms of race broadcast, I won’t complain too much if coverage goes to sky because I’m already stupid enough to pay for it! I can’t see that happening however because it makes so much more sense to have it on FTA and a broadcaster having a long-term monopoly on rights to a sport can only hurt long term income. One last thing, a laughed pretty hard when I saw this story, but only because it’ll annoy Chris Sylt and Pitpass! They’ve been on their high-horse of late, constantly berating any journalist that may disagree with them (Tom Cary especially) about this story. Can’t wait to see how they cover their arses now. That site really is the Daily Mail of F1! Joe on the other hand, top notch as usual. Subscribed to GP+ this year, I only wish I’d found out about it a couple of years ago! With the Ferrari link is it possible this is some alternative to the breakaway championship idea – i.e. merely a bargaining ploy/tool designed to merely last long enough to aid the teams in the renegotiation of the next Concorde agreement? I mean, that’s got to be re-negotiated soon, but they can’t go down the FOTA split route again, I think the twice (?) they’ve threatened it but not done it means they can’t pretend a third time. Ferrari always behaved like they own F1 and the FIA have always given them special privileges so I guess this is the next step. Given the FIA’s inability to grasp the concept of conflict of interest there is probably nothing in any of their contracts that prevent the rights being bought by a company associated with any team. So, after 32 years of following F1, and over a grand this year on HD telly and receiver/recorder purely for Beeb’s HD coverage, looks like my F1 days are numbered or maybe limited to terrestrial highlights. I won’t be paying Murdoch to watch my beloved F1. A sad day. If Murdoch buys it I’ll be able to drop the expensive “tier” I currently get for my FiOS TV, which I get mainly to watch F1, and just download the races off the web. Clause 4.5 of the new Concorde agreement prohibits the teams or anyone directly associated with the teams from doing or saying anything to do with a breakaway series, until the end of 2012. Should you not have had a close look at Clause 14 before writing something like that? Yes, it’s a conflict of interest and nobody will care. Ferrari have always “owned” F1, they just didn’t have the stock certificates to back it up. Now they will. Yes, Bernie knew about it, and no he’s not stupid. The elaborate ownership structure is there to confuse all who attempt to break its code and decipher the truth behind how much income is generated and for who’s benefit. This will not change with the new owners, and based on modern legal practice will likely increase in complexity. Fortunately, all these changes coincide with new rules and regs that have dumbed down the sport in an effort to create “entertaining races”, the introduction of so much money in the sport/business that the concept of sportsmanship has all but disappeared and been replaced by the Briatores of the world who will do anything to succeed, and a future replete with electric cars with fake “soundtracks” produced by speakers. The combined effect of all this simply makes it so much easier for me to walk away from a sport that I have loved since 1979 when I watched Villeneuve and Arnoux battle at Dijon. F1’s best days are behind it, period. I have removed some statements that I felt were ill-advised. I do not agree with you at all. I think the sport is doing OK in a world where it is hard for any real sport to survive. Getting rid of Briatore was a bonus. Times are changing and one should be positive as the future might possibly be better than the past. Am I correct Joe, in my feeling that all companies in your chart having either a Greek letter or “Topco” in them are controlled by Bernie? No, I do not believe that is the case at all. I believe that Bernie owns the shares he owns and probably has a shareholders’ agreement that keeps him in his current role. Why would CVC be involved if they were not controlling the money? Surely the point is by trying to buy F1 itself, or pretending to buy F1 – however you see it – they would NOT be doing anything relating to breakaway series? Joe – I’ve said it before and I will say it again…. I do very much appreciate your optimism and willingness to embrace change. I hope that I am wrong about the future of F1. Could you please give us your expert opinion on what this, if it happens will mean for F1..
Joe, couple of comments. First the structure is confusing. But then I am not a corporate attorney. Second, I appreciate your optimism as well for the “sport”. Third, well I think the future can go either way. Fourth, I am biased because I preferred the old days of Turbo, cheaper prices, better tracks, and legendary drivers (Senna and Prost). Have you ever tried to get a copy of the Concorde Agreement? People are terrified of giving anything away for fear that they will not get paid. I spent years doing jigsaw puzzles, gathering clauses from legal judgments etc. I don’t know the identity of Karen, but clearly she (or he come to that) is probably inside the F1 Establishment, or at least has access to Concorde. I note that Bernie’s chief apologist has been quoting chunks of the Agreement today on another website. I don’t think he has the actual document as he makes lots of mistakes and I am absolutely sure that Bernie would not give him one. But let me get this down, i’m pretty sure every other media took News + CVC deal to be impossible, and editorialised to get that across with no little smugness across their kissy pages. One such stab at negation (or is that negotiation, Bernie, you coy cat you!) was i think founded on anti trust, or on distribution, missing the point that finessing those boundaries is exactly what News does, and no-one yet has ruled them unfair. Sharp, yes, but sharp is as sharp does in any game. There was one guy who commented here, just the twice, and left, who actually pointed out some of the (plausibly alleged) structure of the CVC deal. Had i read that more closely, maybe that would have given me an idea who was under pressure to sell. Rubbish hindsight’s fun, eh? 1. Whatever they’re up to, it’s not been suggested by me. 2. I am somewhat amused to learn Bernie doth occasionally protest too much! 3. lest you think i’m being falsely modest, i merely didn’t say “no way” and i am only half good (the bad half, i am just reminded!) at calling things on my patch, which this surely isn’t. I could equally have said “Joe will not have grapefruit for breakfast this morning”, and then claim i was a genius if he mentioned a slap up full english sometime later. Well, i grew up watching all sorts of big changes in what was then a marginal sport, by the time i was old enough to realise it was a big thing for me and argue with girlfriends to not go out on race weekend to do “their things” it seemed all stitched up. Someone – News Corp – i think thinks this is as exciting as it can be. More shake up the better. Not like the teams can moan about not handling changes. Usual disclaimer, nope i got no clue what this portends. p.s., both gone, but Gianni Agnelli and Enrico Cuccia of Mediobanca used to be mentioned in the same (often inaccurate) breath when big deals went down. Not even David-Weill (Lazard Frères) could touch their patch in Italy. Point here is those guys were the absolute nuts at controlling vast empires through the notional tiniest slices. Names, and maybe legacy styles, to conjour with. Woah, Joe, about other commentors, penny drops suddenly. Hadn’t thought it that way. Every big contract i ever got involved in took so many trees to be pulped, we couldn’t see the woods . .
off now to shake up a slow day, thanks Joe, and thanks too, everyone else, for ensuring a very not dull morning! I find it incredibly frustrating that the Concorde agreement is often quoted as the reason for doing or not doing things. This is really the equivalent of the official secrets act or a super injunction. This cannot happen because the Concorde Agreement prevents it! How? By stipulating what? It’s a secret just, accept anything we say! So where is the FIA veto on the new owner? I bet it’s like our veto in the UK over anything the EU feels like imposing on us, sold down the river by Tony Blair. you just made me splutter a whole mouthful of tea over my desk!! i think i need a Concorde agreement, hidden in my darkest deepest dustiest drawer. Winning all the time must be so much fun! I guess Joe and others of his lesser ilk must think it cruel and unusual punishment . . can we not petition le Cour européenne des droits de l’homme, pour le sauver? That’ll stick this European jolly, right back where it hurts . .
still laughing, thanks pal, nice one. Joe, isn’t GP3 also owned by Bernie or one of the companies you mentioned above? Use bold text next time so we can read these damn things. Do Lbi group, Bambino, Bernie, Staff, JP Morgan and Churchill own altogether 36.4 % of CVC Capital partners whom owns 63.3 % of something ? Or do the mentionned above own altogether 36.4% of the F1 + F1 Paddock Club + GP2 and GP2 Asia and CVC capital partners own 63.3%. Where are the remaining 0.3 % ? Plus, why all these subsidiaries company ? Man, it looks like a Largo Winch comic book. Great post Joe – love the chart! BTW, back in the 80s and 90s I had full copies of the then current Concorde Agreements. I must say I was always surprised how everyone seemed to make a lot of what were very simple and straightforward agreements. Nothing mystical or nefarious about of those docs. But I expect the recent ones are far more complex.